Time to do a little braggin’ on Madie. I do have a genius for a daughter. She is a nice combination of Chris and I. She is so bright and eager to learn and to do well. This is a nice combination. 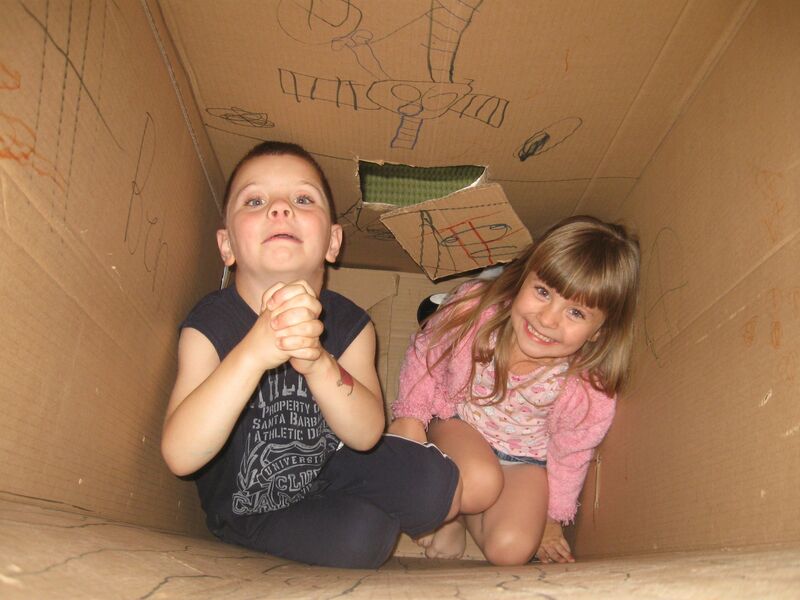 There are too many children out there who are bright and not eager to do well at school. 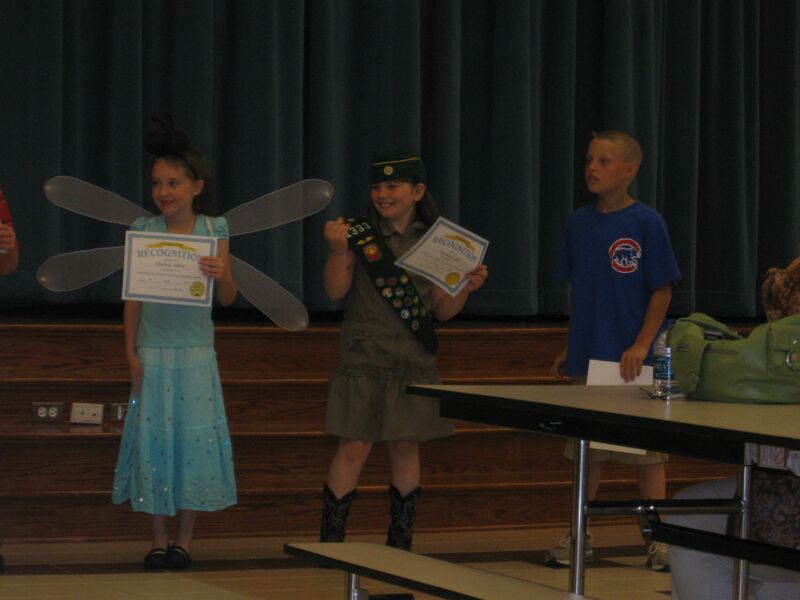 Madie had her reward night at school last week. She earned several awards. Probably her favorite award was top reader. She had more AR points than any other student in the third grade, 300.3 points. She doubled her points from last year. She plans to double her points again next year. That night she set her goal for next year at 600. That’s my baby! And I bet she’ll do it too. And to top it off . . . she got her TAKS scores back (state wide testing). Madie scored 100% in reading and 95% in math (she only missed one). Very few children get these kind of scores. That is really good and worth braggin’ about. She is never going to get a ribbon running the 100meter dash or get a scholarship to play soccer in college. These are not her strengths. But on academic awards night at school . . . she shines! That’s right. If your husband runs into your car and his insurance denies you, you apparently can’t sue your husband. Seriously. Chris really hurt the car. He didn’t dent the bumper. He tore the bumper in half. Geez. Why can’t I sue him? I just need retaliation, and a little vengeance. Well, it would probably cost me more money to sue him than to just torture him. I think I’ll just try the mental torture. That is probably more satisfactory anyways. Of course, Chris would remind me of 1 Corinthians. Dang. He would bring in all that Biblical text. Now I feel terribly guilty about the mental torture that I was planning. And the sad part is that I haven’t even had this conversation with him yet. This is just all in my head. I’ve guilted myself out of torture. Now, I’m even feeling sorry for the poor guy who has wrecked my car. The car is drivable after all. It is just a car. No one got hurt. But it would be nice to have a car with a bumper that doesn’t flap in the wind. I’ll take it in next week to have it looked at. Hopefully it will be an easy fix. Ughhh. Will something please go right? Took Madie to the doctor on Monday for routine visit. The world was good. Took Madie back to school. She came home with pink eye. Told Chris no way I was going back to doctor. Had to work. Chris took her in. After five hours and a trip to a specialist, she came home with a bag of prescriptions (only one for her eye). Chris swears off taking any child to doctor by himself again. Ben’s doctor called that afternoon. Told us to put him back on all heart meds. The weaning of one drug did not work. Will try again next year. Took Ainsley to her doctor’s appt. the next day (this one we had scheduled for a month). Doctor doesn’t know what is wrong with her tummy. Ordered more tests. Included a lactose breath test in this round (that is a trip to TCH). We are tired of all things medical. But it is the end of school, end of soccer season, end of baseball season, end of Girl Scout meetings, and end of routine and the end of things takes energy to finish up and complete. Presents to buy, school stuff to bring home, library books to find. This takes oodles of energy. Things must be sacrificed in order to get things finished and to stay on top of work. Right now that sacrifice has been laundry, dishes, and sleep. Please come to the front door when knocking. At least the entry way is clean. No one can see the piles of laundry or sink full of dishes from there. It is really bad. Even the car hasn’t had a break. Chris backed into my “Homer” (the minivan’s nickname). It’s not good. So . . . I just need something to go right. A doctor who says, “Don’t worry about it. That’s normal.” A fairy who comes to my house to scrub the toilets and mop the floors. A husband who remembers that my car won’t move out of the way with a little tap. A school who says, “Do you mind if we keep all of your child’s work? We want to scrapbook the good stuff for you and throw away all of the extraneous stuff.” Do you think it will happen? Probably not. 71 days until we go to the beach. I think I’m going to need it. 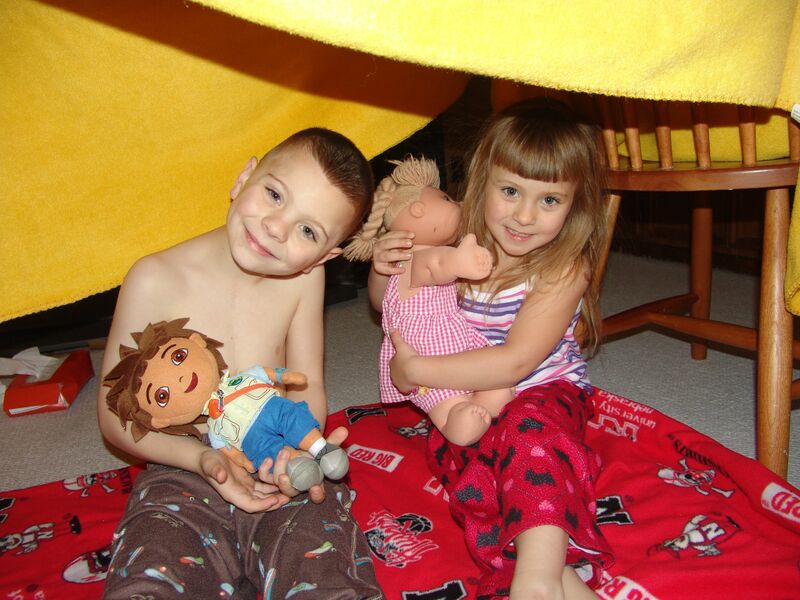 March 6, 2011 – A few blankets and some chairs Add together and you get a really cool tent. April 16, 2011 – Madie is part of the Gifted and Talented program at school and this school’s GT program is guiding them to do a research project. 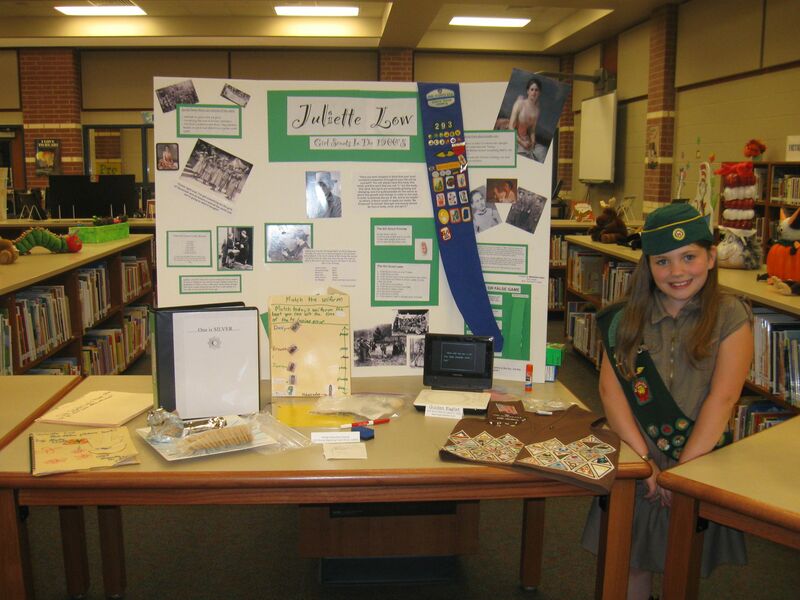 Madie picked to do a project on Juliette Low. 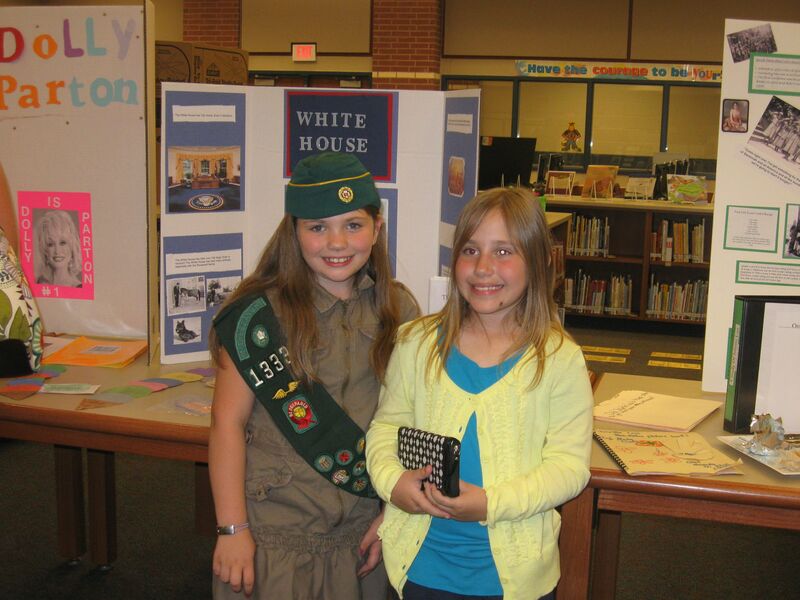 She wore her Grandma Grace’s uniform and she had my and her uniform in the display too. She even had her Great-grandma Himes membership card from her years of Girl Scouts in the 1930’s. It was a fun project that she had a good time doing. She was so proud and she had a reason to be. I’m waiting for the other shoe to drop. Is it that time of the year? Have the weather patterns suddenly shifted over the last few days? Have I walked into a parallel universe? I think that the answer is “yes.” Life around me seems to be out of whack. A lot of people in my world seem edgy, stressed, and just not their usual selves. This is soooo frustrating. This yuck keeps creeping into my little world in small and minute ways. Time to puts the brakes on it though. We’ve got enough to deal with, without letting the rest of this ick filter into our world. 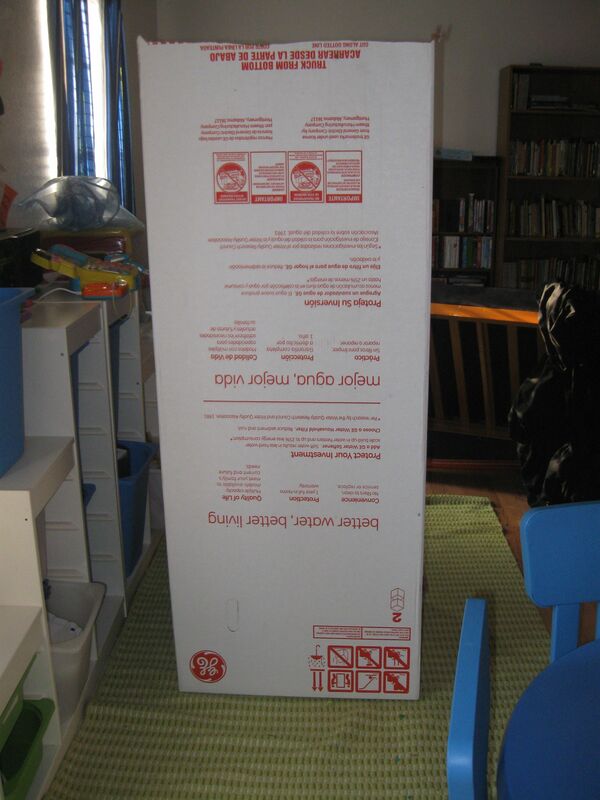 What do you do with a hot water heater box? Play with it of course!